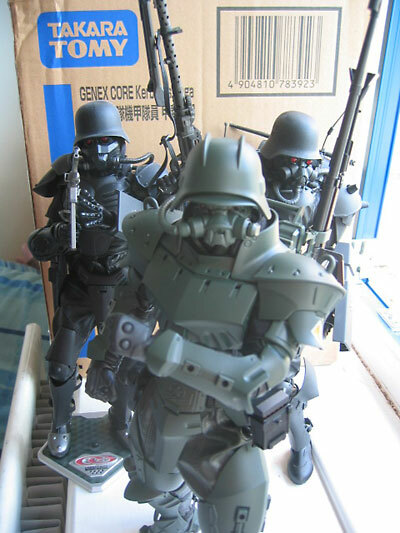 New guest reviewer Joshua Dawney takes a look at one of the cool Kerberos themed sixth scale figures from Takara - why don't I own one of these yet? Tell us all about it, Joshua! Hi! First of all, thanks to mike for letting me do this review! This is the ground self defense forces (gsdf) member Kai Tetsurou in type 61 reinforced protect gear! 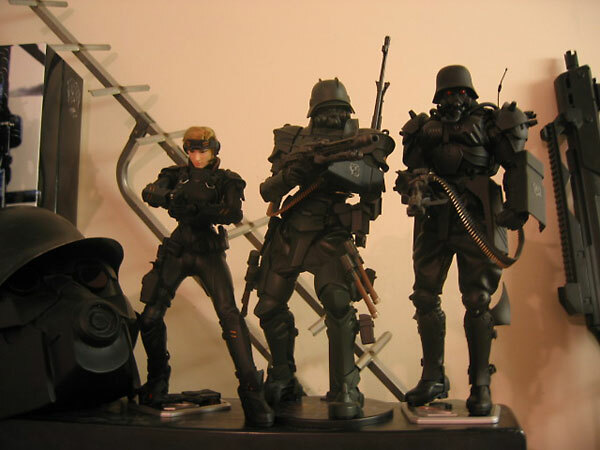 In case you are wondering what this figure is from, it is part of the kerberos saga, featuring manga, radio dramas and movies such as jin roh: the wolf brigade, stray dog: kerberos panzer cops and the red spectacles. 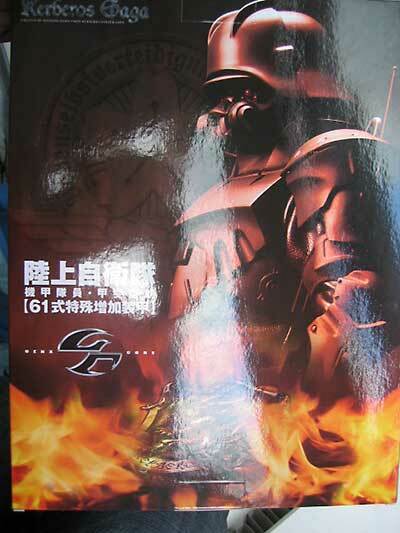 This is the 7th kerberos release from takara tomy (after the three versions of midori washio, and the three male panzer cops: koshiromaru chuichi, kouichi todome and souichiro toribe) and in my opinion it is the best so far! Before i go on in this review, i just have to say that this figure is designed to be modified. yes, it is designed with customising in mind! The armour is sculpted fantastically. it is clean, crisp, precise work, with smooth surfaces, sharp lines, varying angles, lots of grooves and details and perfect symetry. amazing work. The head is nice too. some great work on the hair, while the ears and nose have alot of character. the many hands are also very detailed, with some very natural poses and realistic creasing. There isnt much to paint on this figure, but where it is, it is good. The armour has only one painted part, the left shoulder armour flap.the paint lines are clean and crisp, no smudging whatsoever. The head is not particularly detailed paintwise, but it works well especially for the slightly anime look. It has painted lips, which actually look very nice, not like some figures where it appears as if they are wearing lipstick. The eyes are glossy, and centered very well (he isnt looking in odd directions) while the brown hair has some little highlights that help bring out the sculpt. But anyway, it is pretty darn articulated HOWEVER, the uniform does restrict movement somewhat (though that is kinda unavoidable) and some areas have multiple layers, such as the arms for instance, where there is the sleave of the jacket, the pleather wrist glove, and the many straps for the arm armor. 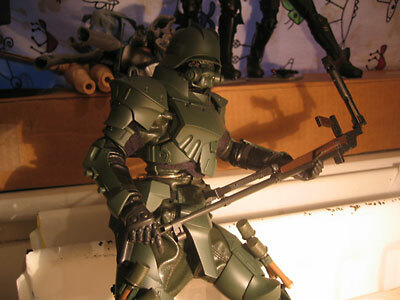 This results in loss of articulation, but with a little fiddling you can still get many interesting poses. 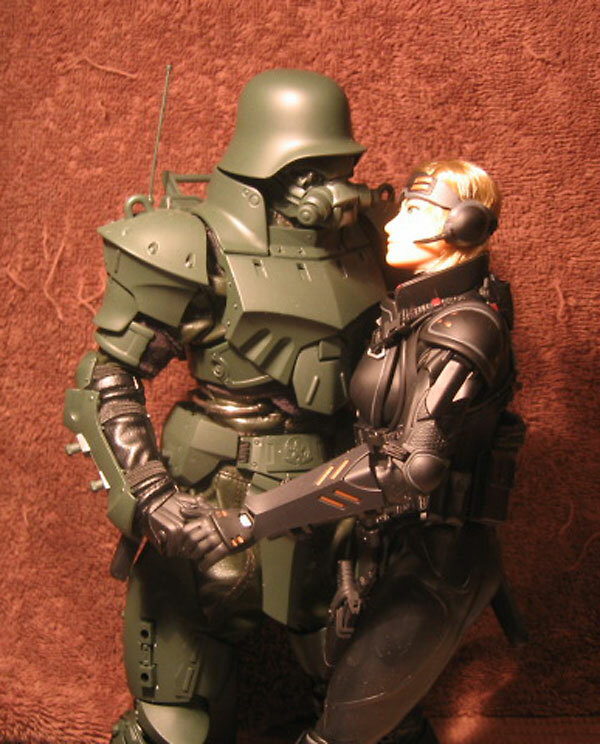 a unifor swap might allow better articulation, particularly since the german officer pants tend to prevent movement. The uniform is where most of the small issues lie (restricted movement being the main one). The pleather material is very nice, but doesnt look quite as durable as the male panzer cop or midori, and it feels a little thinner, so keep and eye on it, as breakage may be an unfortunate possibilty (i hope it it wont, as ive had no problems with takara so far). However, its the armour, vest and boots where this figure really scores! The armour is fantastically well sculpted to fit the body. 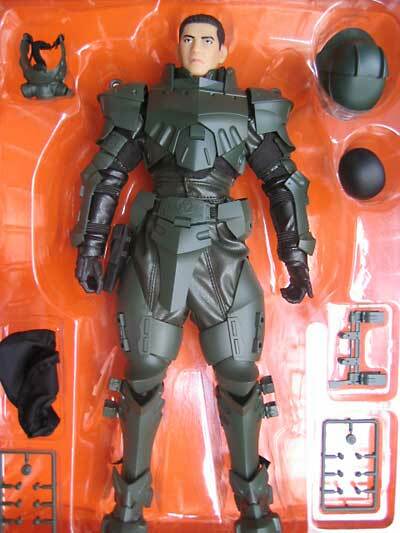 Some parts such as the chest/collar/back armour are multiple parts that clip together perfectly to fit right on the body, not too tight, not too loose over the uniform. The boots are fantastic also, as the soft pleather looks and functions very well, allowing natural articulation of the ankles. 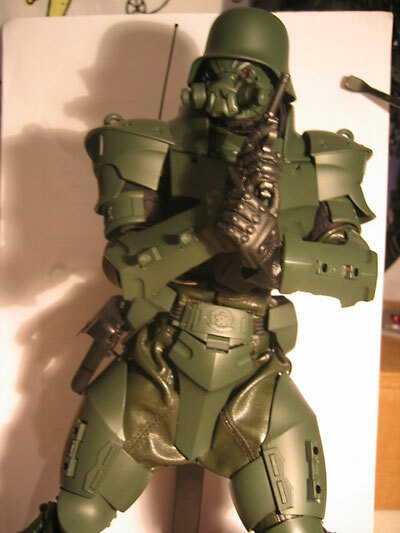 The shin/foot armour is very nicely done too, fitting well together without impeding moving much at all. there is also the vest, fits nice and snug on the figure, and straps together with velcro. Basically he is loaded. having a total of 9 hands is just great! this figure a serious loadout! The rifle itself is very detailed, and has folding stock, slots to put the spre ammo boxes, folding carry handle, functional bipod and loops to put a strap. This figure is interestingly customisable. there are 18, yes18, attatchment holes located on the body, with some on the shin armour (2 each side) hip armours (4 each side) belt/waist boxes (1 each side) and wrist gauntlets (2 each side). 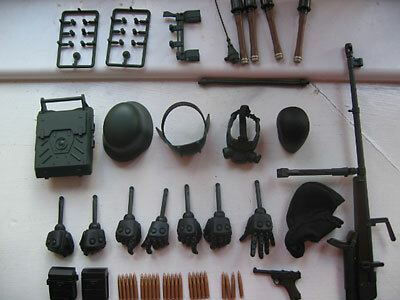 This allows you to mix and match attatchments such as grenade holders, ammo boxes, tubes, the antenna and whatever else takara makes with plugs. the backpack also has 2 holes either side, while the mask has 1 hole each side (two of the plugs are breathing filters), and the back armour has two holes for the breathing tube. so in total, thats roughly 26 holes! 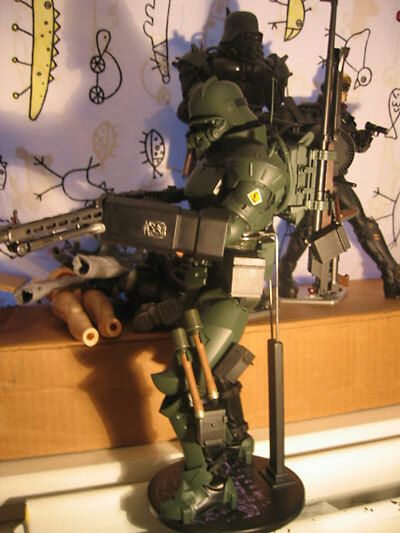 if you get multiples of this figure, you could load out one figure with 2 grenades each shin, 4 each hip, 1 each side of waist, 2 on each wrist, 2 on each side of the the backpack and dual breathing tubes! thats 22 grenades or whatever else you want to add!!!!!! The pzb39 rifle holder can be put either side, as can the tube, antenna and mask filter cap. The backpack can be swapped with backpack from midori, or the backpack from koshimaru, or the ammo barrel from koshimaru, or even the jetpack from the cool girl CG13 rocket girl eris figure. 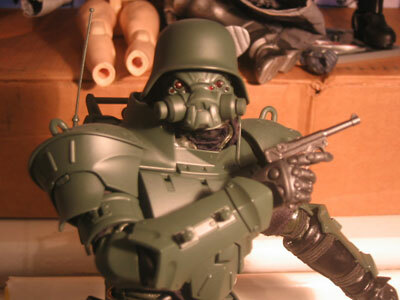 With the fully removable armour and uniform, interchangable hands and head, this is definitely customiser friendly. No doubt the extra holes will be utilised by the future versions takara will release, obviously at least one will include wrist shields. 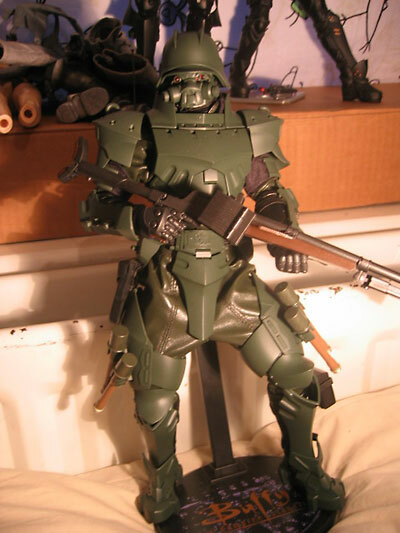 The one draw back is that all this interchangabillity, removable parts etc makes this figure somewhat fiddly, and a little top heavy with the attatched rifle, so take care, and do not give to kids. I like this figure alot, and hope for more from takara. its just so darn awesome that the small issues it has kinda seem to dissappear. I'm giving it 3.5/4 (this would be 4/4 were it not for the uniforms minor problems. Swap out for a different uniform and you can put it up to 4/4). The only other factor is price, but im leaving that out as this is a collectable for adult collectors, so value will differ between individuals dependant on how much they want it. Also, i expect the price on the secondary maket to drop a little over the next couple of years.